This site receives between 1.5-2.2 million visitors per year, and has 74,000 daily email subscribers and over 350,000+ followers via Facebook, Twitter, Instagram, etc. I talk about philosophy, fiction, Christian history, Catholicism, family life, and baptized Stoicism (a la Saint Ambrose). I’m allergic to peanuts and sulfites. I’m married to best friend Joy. We met on a blind date to a Baylor University Christmas concert. 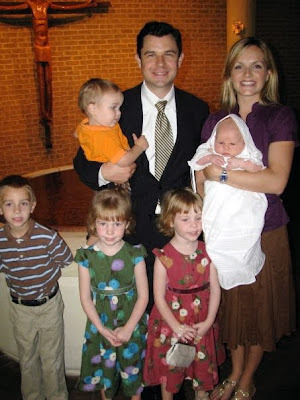 My wife Joy and I have 8 children spread out over 14 years. I’m a Texas Aggie. Whooop! Joy went to Baylor. We live in Colleyville, Texas. Theologically, I’m a rock-ribbed Thomist. I was ordained as an Episcopalian priest before entering the Catholic Church. Read a brief account of Taylor’s conversion from the Episcopal priesthood to the Catholic Church. Joy and I became Catholic in 2006. Although I am allowed to pursue Catholic Holy Orders as a married man, I have discerned that I am currently called to be a married lay man. I earned a PhD in Philosophy in 2011. The title of my dissertation was: “Thomas Aquinas on Natural Law and the Two-Fold Beatitude of Humanity.” It’s partly a critique of Henri de Lubac’s “single beatitude” read on nature and grace. I love the Latin Mass and Byzantine Divine Liturgy. I write books about theology and philosophy. Here are my books on amazon. I write fiction, too. I have a #1 Amazon Bestselling young adult novel Trilogy about Saint George titled Sword and Serpent about Saint George and the Dragon (and Constantine). My favorite movie is It’s a Wonderful Life. I’ve written about my struggles with George Bailey Syndrome here. My favorite food is Mexican. Chips, salsa, queso, and guacamole tug at my concupiscence! I used to be a big home brewer. My favorite creation is a beer I did with my brother: Minced Meat Christmas Ale. I either had or developed an allergy to barley. No more beer. My musical artists derive written from 1966-1970. Clapton. George Harrison. I’m also not afraid to admit that I’m a big fan of “Higher Love” by Steve Winwood. Those lyrics are Augustinian…seriously. If you’re ever in a bad mood, listen to “Higher Love” and you’ll be happy again. My favorite Scotches are Oban 14 and Johnny Walker Blue. I make videos regularly. Please visit my Youtube Channel: Taylor Marshall. I produce a popular podcast on iTunes called The Taylor Marshall Show. I founded the Troops of Saint George, an adventure fraternal apostolate for Catholic men and their sons. I founded the New Saint Thomas Institute in 2013 to provide online video theology and philosophy classes to people across the globe. We have over 2,500+ students on six continents. You can join us and take online Catholic classes with me through the New Saint Thomas Institute here. Welcome to the site and welcome to the conversation! However, I’m not pessimistic about it. I also believe that the culture can be won back by employing supernatural means. Souls can be saved by promoting a rediscovery of Catholic philosophy, theology, history, art, literature, and liturgy for the greater honor and worship of Our Lord Jesus Christ. I post about 2-3 times every week on topics ranging from saints, liturgy, Thomistic philosophy, theology, the Church Fathers, and one of my favorite topics, Mariology. I try to put out a new free podcast every wee, which you can listen to here. What’s the Best Way to Join the Conversation? The best way to join in on our cultural conversation is to subscribe to this blog by email. There are over 23,500 people signed up for the daily blog posts and they love it! When you do so, you will receive an email 2-3 times per week from me. You have my guarantee that your email address will never be shared with anyone! Also, I’m not asking for money. It’s just a blog. Don’t worry. Please sign up and you’ll receive a helpful posts. If you don’t like it, you can easily withdraw with no questions asked. There is a convenient unsubscribe button available to you if you want to unsubscribe, but I don’t think that you will unsubscribe. Please click here and take 3 seconds to sign up to receive the blog posts by email. If you care to contact me, please do so. The best way to do so is through Facebook. Please click here and “Like” the page that you come to. That will put us in contact.